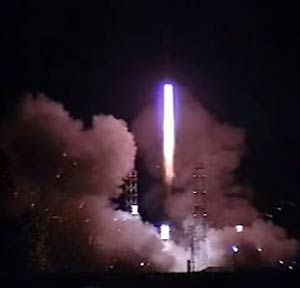 A Russian Proton rocket launches the new Sirius FM5 XM radio satellite into orbit on June 30, 2009 from the Central Asian spaceport of Baikonur Cosmodrome in Kazakhstan. Anew broadcasting satellite for Sirius XM Radio launched today aboard a Protonrocket, beginning a 9-hour journey to a high-altitude transfer orbit stretchingmore than 22,000 miles above Earth. The Sirius FM5 satellite,the company's fourth spacecraft, blasted off at 1910 GMT (3:10 p.m. EDT) fromthe Baikonur Cosmodrome in Kazakhstan. The 12,831-pound satelliterode off the launch pad on nearly 2.5 million pounds of thrust produced by theProton's six first stage engines. The rocket shed its first stage two minuteslater, giving way to the launcher's second stage for a burn lasting aboutthree-and-a-half minutes. The single-engine thirdstage took over for its firing and the Proton jettisoned its payload shroudduring the sixth minute of flight. The third stage separated from the Breeze Mupper stage about ten minutes after liftoff, ending the Proton's role in themission. Officials withInternational Launch Services, the U.S.-based firm overseeing commercial Protonflights, confirmed the Breeze M completed its first burn to arrive in atemporary parking orbit about 111 miles above the planet. The hydrazine-fueled upperstage will ignite four more times to gradually boost Sirius FM5 closer to itshome in geosynchronous orbit along the equator. The Breeze M's final burnwill place the spacecraft in an orbit with a high point of 22,236 miles, a lowpoint of 2,614 miles, and an inclination of 22.9 degrees, according topre-launch projections. The rocket will deploySirius FM5 at about 0424 GMT (12:24 a.m. EDT). The next ILSProton launch is scheduled for early August with the AsiaSat 5communications satellite. That mission will be followed by the launch ofCanada's Nimiq 5 spacecraft in early fall, officials said.